Here are a list of removal companies based in Scotland. They are listed in order of the number of reviews and likes. Professional BAR domestic removal company covering all aspects of your move to and from Scoland Highland & Islands. Family Run Business Based in Wick and Thurso Caithness operating Throughout the Scottish Highlands, Weekly Door to Door Service Throughout the U.K., Single Items - Full Loads, Local and Nationwide Services, Dry Secure Storage, Fully Insured and at Affordable Rates! Small domestic and commercial removals company based around the central belt of Scotland. Fast and friendly. J L Young are an Ayrshire based company with over 65 years of experience in providing a fast and efficient removals and storage service exclusively to individuals and companies! We are very proud of the repeat business we have achieved over the last 65 years, and the continuing confidence our customers place in us. Our entire house moving team is committed to you, from day one right through to completion of moving home and beyond. Our team is available from 8am to 8pm seven days a week with every call answered in person by staff working tirelessly to ensure that everything is in place for your stress free removal. BSR Removals are a professional removals company based in Edinburgh, Scotland. 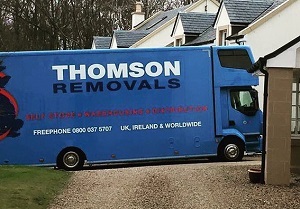 Thomson Removals was started in 1995 by Matt and Elizabeth Thomson, they operate from a warehouse in Dundonald Ayrshire with 30,000 square feet. They are members of the British Association of Removals and use purpose designed removals vehicles to ensure your possessions are kept safe during the move.